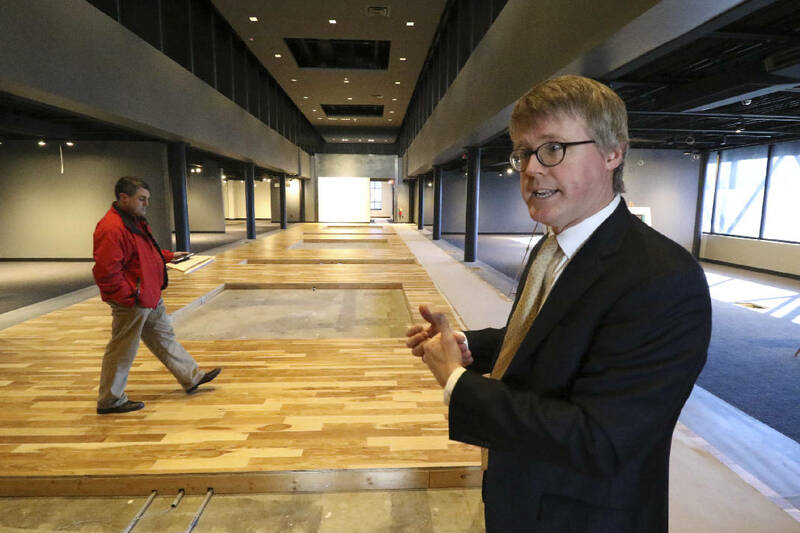 In this file photo Vince Butler, left, examines the space as Daryl Black, right, leads a tour of the new Chattanooga History Center on Friday, January 15, 2015. The Chattanooga History Center, which was unable to raise enough money to open a museum adjacent to the Tennessee Aquarium downtown, is now considering a "virtual museum" online while also continuing to look for a permanent physical space. Most of the items in the center's collection are photographs, maps, drawings or documents, all of which lend themselves to display online, said Carl Henderson, the center's treasurer. Visit the Chattanooga History Center at chattanoogahistory.org. The Chattanooga History Center at 2 W. Aquarium Way has been reclaimed by the River City Co., which held the mortgage on the 2-story building for the past decade while the museum tried to raise funds to open the downtown attraction. The words of Robert Penn Warren remain on the wall of the ill-faded museum site. "We think of ourselves as Gig City, so doesn't that kind of fit that we would have a virtual museum?" he said in an interview Monday. For now, the center's collection is housed in a city warehouse on Watkins Street and in a portion of the space near the aquarium where the center hoped to build a state-of-the-art museum. The lease for the city warehouse runs out in March but the City Council will consider renewing it sometime in February, according to city spokeswoman Marissa Bell. In moving the history center's collection from a commercial storage facility in Ooltewah into the city's warehouse, center officials and curator Marie Bourassa realized that some of the items had little connection to the city's history and could be "deaccessioned" — or returned to their donors, Henderson said. "Think a 1949 seven-inch Motorola television set," Henderson said. "I think in some prior existence of the history center we became a storage house for things people thought were neat or different, but not necessarily anything tied to the history of Chattanooga." The history center bought an ad in the Times-Free Press this week and has also posted a list on its website of 83 people or organizations that donated items that the center now wants to return. It is common for museums or libraries to reduce the size of their collections to remove items that are duplicates, or which are no longer deemed worth keeping. For a decade, the center pursued an ambitious plan to raise $10.5 million and create a state-of-the-art history museum in the space above and adjacent to what is now Puckett's Restaurant near the aquarium downtown. The space was previously used by the city's convention and visitors bureau. The opening date was delayed repeatedly and, last January, museum officials said they had spent about $4 million to renovate the space, but needed more funding before they could open. Those funds proved unavailable, however, and last July the nonprofit downtown development group River City Co., which owned the property, took it back, and much of it is now being used for the National Geographic Monster Fish exhibit. 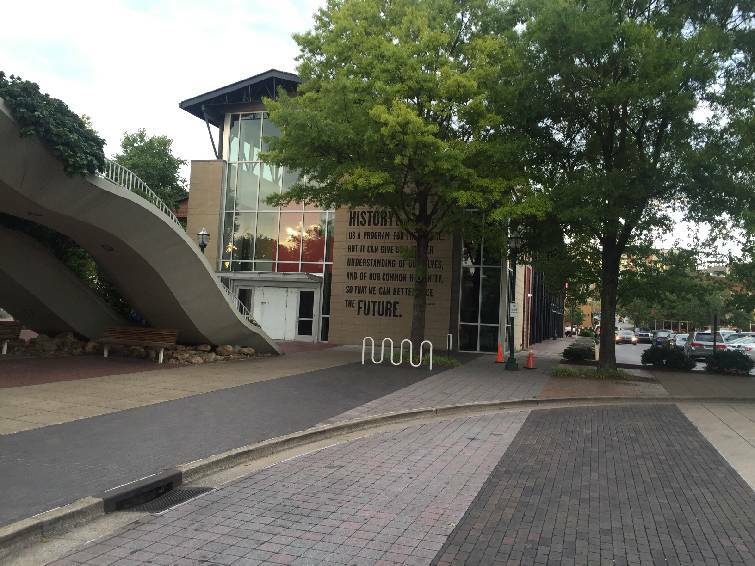 The history center talked to officials at the Chattanooga Public Library about moving its collection there, but that did not lead to any specific plan, said Richard Beeland, chief administrative officer for the library. Henderson said for now the hope is that the history collection will end up in a city-owned space, or as an extensive online exhibit, or perhaps both. "We're still working with the city on a permanent location of the center," he said. "Until we get past probably this September, we really won't know any more than we know today." River City is still looking for a long-term tenant for the space the history museum vacated, once the Monster Fish exhibit leaves in May. "We want something awesome there that adds to the totality of the riverfront," said River City President Kim White. Contact staff writer Steve Johnson at 423-757-6673, sjohnson@timesfreepress.com, on Twitter @stevejohnsonTFP, and on Facebook, www.facebook.com/noogahealth. The Chattanooga History Center is returning some of its collection to the people or organizations who donated the items. The deadline for contacting the Chattanooga History Center is Tuesday, Feb. 28. Call 423-265-3247 or email chc@chattanoogahistory.org.